Every once in a while, you run into places where a drafting tech made some mistakes on the schematics. 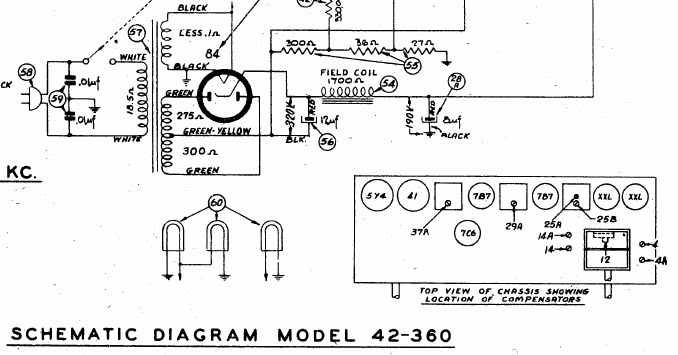 This one was a Philco 42-360 radio, which has the wrong tube called out in the tube line-up vs. the schematic. The actual radio uses an 84/6Z4 rectifier tube, but the tube line-up shows a 5Y4 in its place. These would definitely not work if substituted. It’s pretty common to find drafting mistakes. Another Philco, wired per the schematic, had no B+ on the detector/1st AF tube. The Sam’s Photofact of the EICO HF-81 has the tubes all numbered wrong, versus the EICO schematic where they’re correct. And so on. Keep a close eye out when working on vintage gear! You can’t always trust the schematics. This entry was posted in Commentary, Electronics, Vintage and tagged drafting, error, mistake, schematic. Bookmark the permalink.